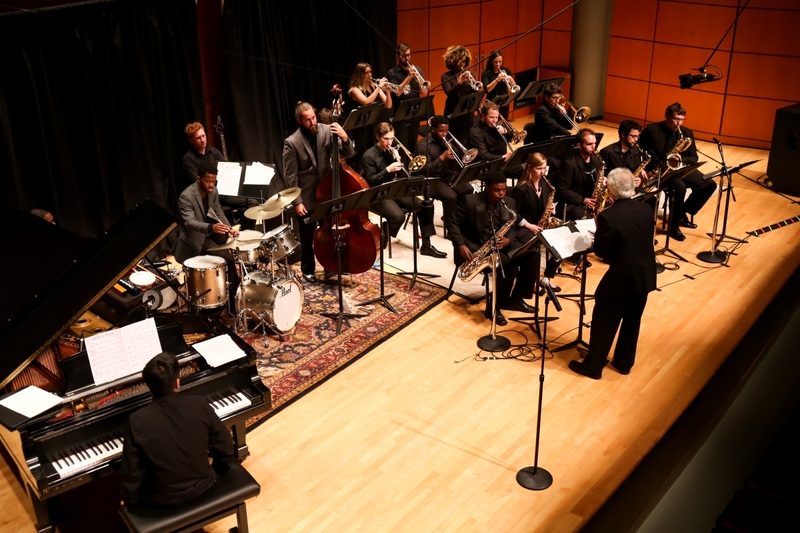 The University of Georgia's jazz program consists of ensembles and combos, jazz improvisation and private lessons. Students have the option of either formally applying and auditioning for the jazz minor, or they can particiate individually in various jazz ensemble opportunities. Jazz Private Applied Lessons at UGA are a one on one lessons open to music majors on all instruments. Students learn a variety of commonly used song forms based on American standards as well as jazz standards, study jazz harmony and melodic structures, and work on exercises in all keys to develop improvisational skills. The Jazz improvisation course at the Hodgson School is open to all UGA students—both music majors as well as non music majors—by audition. The class format is similar to another combo, including drums, piano, guitar and bass, with lead instruments. Students study song forms of American standard tunes by such composers as George Gershwin and Cole Porter, as well as a broad cross-section of jazz standards by composers like Duke Ellington, Horace Silver, Miles Davis, Chick Corea, and other contemporaries. The course requires students to rigorously practice and study all chord qualities and corresponding scales in depth on their respective instruments with the goal of forming scale-based melodies over sets of chord changes. Students will also have a weekly transcription assignment of a standard or jazz standard recording. The Jazz Improvisation course meets twice per week. Instrumentation is saxophones, trombones, trumpets, plus rhythm section including piano, bass, drums, and guitar. This ensemble rehearses music from all eras of big band jazz, from Duke Ellington through contemporary composers. Students are accepted by audition. The UGA Jazz Band I has performed by invitation at the Montreux Jazz Festival in Switzerland and the Vienne Jazz Festival in France. Questions about the Jazz program should be directed to Prof. David D'Angelo.